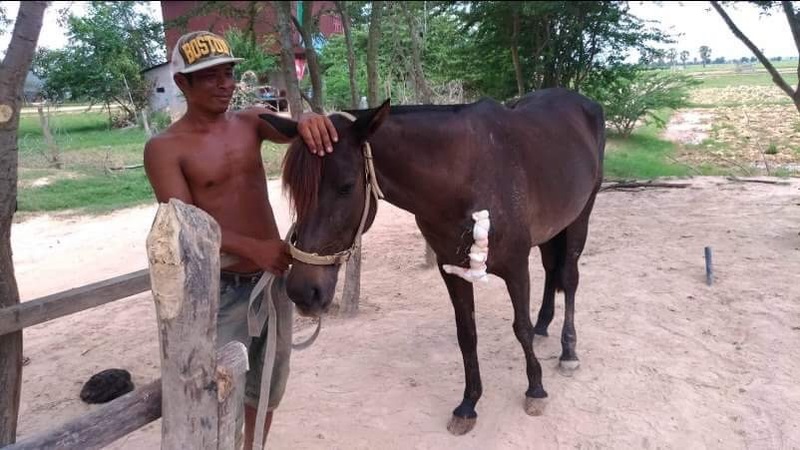 Cambodia Update: A message from a local Cambodian pony owner who wanted to send his thanks to you! Mr. Youen Samphors owns ponies in Sihanukville and he raises them for work transporting goods and materials. With his young experience he said that “The way of raising my ponies is very traditional so it made it difficult to succeed. Before I knew Cambodia Pony Welfare Organisation [CPWO] most of my ponies easily get infection by some diseases such as Tetanus, Surra, Colic problem, wound... etc. When those diseases or problems happened for my ponies there’s almost no way to heal or recover, so sometime it made me hopeless to raise the ponies. But after CPWO came into my place, my hopeless had release out by wing and I feel like I am a new parent for my ponies. I know how take care and prevent diseases and sickness because CPWO gave me the knowledge and taught me a lot. This is better than treatment! What I would like to say is thank you very much CPWO that came for help my ponies”. At the end he wish, CPWO will continues this mission to save my ponies and all the ponies in Cambodia. Thanks to our Animal Aid Abroad supporters and donors who fund CPWO to help these ponies and educate their owners to look after their animals. Pictures show a case where one of Mr Samphors horses had a very bad chest wound that was treated and healed with the help of CPWO and AAA donors. Animal Aid Abroad Trip 2019 ~ 6 spots still available, 10 already sold.